Chin Kwai Fatt, after having signed a false declaration on your own company's report, on what basis can any employee of PwC Malaysia take part in the National Annual Corporate Report Awards, let alone chair the committee? For Chin Kwai Fatt, the managing director of PricewaterhouseCoopers, the challenge ahead is to help restore public confidence in corporate reporting. Obviously Mr Chin Kwai Fatt did not rise to the very challenge he called out to the industry, and in fact has fallen so far short of it that we would not try to mention his name and factual corporate reporting in the same breath, ever again. Ms Loh Lay Choon,. while you are there checking through various company reports as the Alternate Chairman to the NACRA organising committee, what about the fraud involving your own company's Senior Staff? "Winning the prestigious NACRA award has increasingly become a target of many organisations, which clearly demonstrates the wide recognition of NACRA as the benchmark for excellence in corporate reporting. The awards aim to promote greater corporate accountability and more effective communication by organisations through the publication of timely, informative, factual and reader-friendly annual reports. This is the very essence of NACRA’s theme – “Towards Accountability and Excellence”. Ms Loh Lay Choon, how will you judge the following report, that your MD, Mr Chin Kwai Fatt signed in 2008 for PricewaterhouseCoopers Consulting Sdn Bhd (464379-U)? 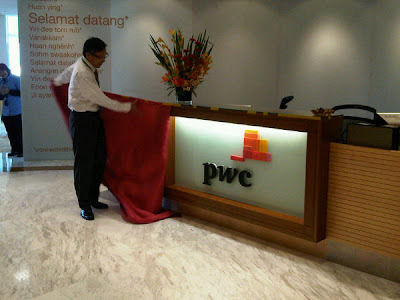 Chin Kwai Fatt signing off in 2008 for PricewaterhouseCoopers Consulting Sdn Bhd (464379-U), that it can meet its liabilities as and when they may fall due, without disclosing the contingent liabilities, or showing that the firm passes the required solvency tests. In short, Chin Kwai Fatt signing a false declaration. Ms Loh Lay Choon, if you have been too busy to look at this particular report, you can read the gist of it here, where we also share how Chin Kwai Fatt has also fallen foul of the Malaysian Penal Code. Tell us, is there any awards that can be presented to Chin Kwai Fatt & Co? Is there one for most fraudulent reporting by an audit firm? On what basis, Ms Loh Lay Choon, does PwC in Malaysia, or any of its employees and partners think that they are qualified to tell the rest of the country who has done a good job, as far as honesty in Corporate Reporting, Accounting Practices or simple ethical bookkeeping goes? It will make more sense for one to get their own house in order first, before deigning to tell others if they are doing a proper job of it.